This flamboyant depiction of the architect, Hugh May, conveys with complete assurance the elegant self-confidence of the Royalist sitter. The brilliant blue mantle worn by May contrasts with the more subdued tones generally favoured by Samuel Cooper in his male subjects of this period. The sitter was a close friend of Sir Peter Lely and is portrayed in a double-portrait with the artist (Audley End, Essex). 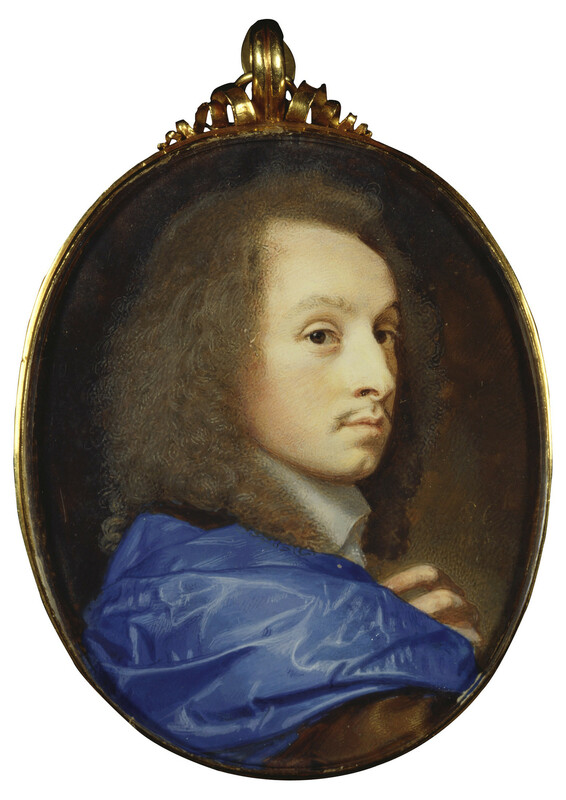 Comparison with that portrait confirms the identity of the sitter in this miniature, which descended directly in the May family until the mid-nineteenth century. May spent several years in the late 1650s at the exiled Royalist court in the Netherlands. After the Restoration he was appointed Paymaster of the Works with responsibility for overseeing Charles II's palaces and residences. He was promoted Comptroller of the Works at Windsor in 1673, and was charged with completing Charles II's extensive programme of rebuilding at Windsor Castle, replacing the fourteenth-century buildings of Edward III in the Upper Ward with a suite of contemporary State Apartments decorated in the Baroque style with ceiling frescoes by Antonio Verrio and wood carvings by Grinling Gibbons. May's only surviving domestic building is Eltham Lodge (1664) which exemplifies the Dutch Palladian style with which his name is associated. Ultimately, his contribution to seventeenth-century architecture was overshadowed by that of his contemporary, Sir Christopher Wren. Signed on the right in gold 'S.C.' and dated '1653'.